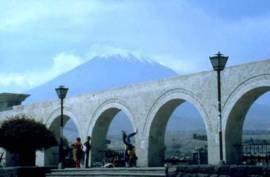 Arequipa is the capital city of the Arequipa Region in southern Peru. With a population just under one million, it is the second largest city in the country. Arequipa lies in the Andes mountains, at an altitude of 7,800 feet above sea level; the snow-capped volcano El Misti scenically overlooks the city. The city has many beaufiful colonial-era Spanish buildings built of sillar,a pearly white volcanic rock, from which it gets the nickname La Ciudad Blanca ("The White City"). The historic center of Arequipa was named a UNESCO World Heritage Site in 2000, in recognition of its architecture and historic integrity. One of the most remarkable sites is the Convent of Santa Catalina. It is a cloistered convent built in 1580 and was enlarged in the 17th century. There are approximately 20 nuns currently living in the northern corner of the complex; the rest of the monastery is open to the public. The tradition of the time indicated that the second son or daughter of a family would enter religious service, and the convent accepted only women from high-class Spanish families. Each nun at Santa Catalina had between one and four servants or slaves, and the nuns invited musicians to perform in the convent, gave parties and generally lived a lavish lifestyle. Each family paid a dowry at their daughter's entrance to the convent, equivalent to US $50,000 today. Arequipa is the starting point for a 2- or 3-day excursion to the Colca Canyon, located about 100 miles northwest of Arequipa. It is more than twice as deep as the Grand Canyon in the United States (13,648 feet). However, the canyon's walls are not as vertical as those of the Grand Canyon. The Colca Valley is a colorful Andean valley with towns founded in Spanish Colonial times and formerly inhabited by the Collaguas and the Cabanas. The local people still maintain ancestral traditions and continue to cultivate the pre-Incan, stepped terraces. 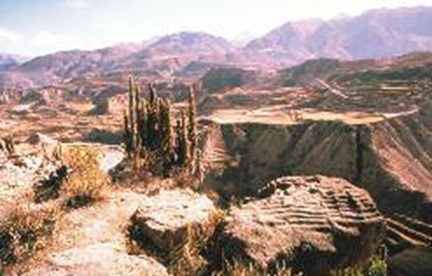 The small town of Chivay is on the upper Colca River, where the canyon is not so deep but where many terraces are present in the canyon and continue for many miles downstream. 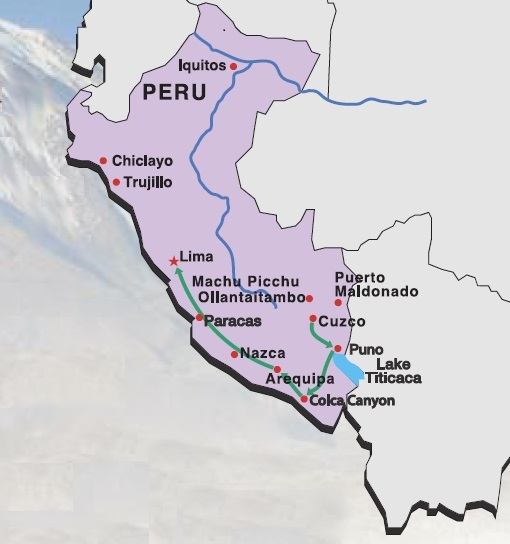 As the canyon deepens downriver, a series of small villages is spread out over the approximately 35 miles (between Chivay and the village of Cabanaconde). The canyon reaches its greatest depth about 15 miles to the southeast, in contrast to Nevado Ampato, a 20,630 feet snow-capped extinct volcano. Day 1: Puno (Lake Titicaca) or Lima to Arequipa - Departure by air to Arequipa and transfer to your selected hotel. Day 1: Arequipa to Chivay - In the morning you leave Arequipa and head towards the valley. On the way you pass Pampa de Arrieros, Pampa Cañahuas (the Vicuna National Reserve of Aguada Blanca), Vizcachani and Tojra, a good place for spotting Andean birds. The awesome volcanoes of Mismi (18,360 feet), Misti (right, 19,110 feet), Chachani (19,930 feet), and the glaciers Ampato (20,630 feet), Sabancaya (9,606 feet) and Hualca Hualca (20,630 feet) offer panoramic views as you enter the Colca Valley. After a 4-hour drive you arrive to Chivay, Colca's most important town where you have lunch. In the afternoon you will have a chance to relax in La Calera hot springs, located in a beautiful, open-air setting (indoor swimming pool also available). Then you'll make a short stop to explore the picturesque town of Chivay and visit the local market. Overnight at your selected lodge.